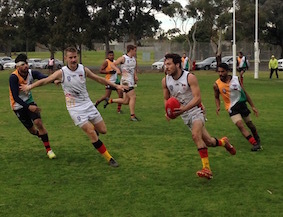 The German Eagles firmed as serious contenders for the Division 2 title today, with a big win over India at the Keysborough Playing Fields in front of a crowd of Year 7 students from Mentone Grammar. The Germans were able to use their advantages in height and team structure to account for an improving Indian side. The Germans opened the scoring with a mark and goal to Constantin Pixa. However, India replied quickly, with Aashish Sharma kicking India's first goal of the tournament. The rest of the term remained a tight tussle, with the Germans not able to fully break free until Jan Hüsken crumbed a goal late in the term. At the first break, the Indian huddle was showing a lot of pride in their efforts, with coach Yasser Hussain instructing his charges to keep the ball out of the packs and use their leg speed in the open to their advantage. However, the second term opened with the Germans amping up the pressure, using their significant height advantage over the Indians to hit targets in the forward line, only their inaccurate kicking stopping them from getting even further in front. Johannes Orlowski booted a long kick forward which bounced through for a goal to the Eagles, the halftime scoreline at Germany 5.7 to India still on 1.0, with India's Zuber Baig stretchered off from a bump to the face in a pack. India came out hard in the third term and set up chances to peg back the margin, with Daman Beshra receiving a free kick close to goal but only managing to kick a behind. From there, the Germans retook control, with Jakob Jung and Philip Evermann generating plenty of run out of the centre, and forward targets such as Jan Hüsken and Johannes Orlowski ready to receive and goal. Jan Korfmacher scored a crowd-pleasing rover's goal on the run out of the pack, and when the three quarter time siren sounded, the Eagles were 48 points ahead. India's lack of tall targets started to show, with the Indians holding possession in defence, but unable to to progress far beyond the centre square. 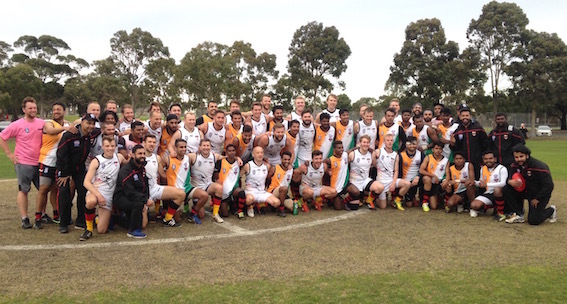 The final term saw Indian full back Parveen Singh taking a number of strong marks on the last line of defence, and Sagar Ashoka gaining regular possession, but ultimately the Germans held sway, kicking another four goals to run out 77 point winners, 12.14 (86) to India 1.3 (9). Indian coach Yasser Hussain said post-match that he was happy of the four-quarter effort the Indian side put in, and that they need to continue working on eliminating basic skill errors and continue to improve throughout the tournament. Next opponent will be Pakistan, in Bendigo on Friday night, in what looks on paper to be a more even match-up. 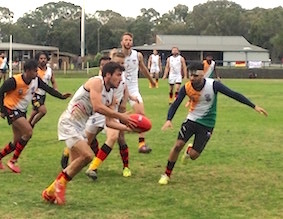 German coach Mark Woods was critical of his side's slow start to the match, but confident they can put in a good showing against Japan at Box Hill North this Saturday. Whilst some onlookers at the ground were tipping the Germans as favourites for the Div 2 title, Woods was more cautious, saying "We have to take it one game at a time. We've got to beat Japan first, and then you've got challenger in China - they beat Croatia first-up, who are a tough side, we've seen Croatia beat Ireland in 9-a-side footy at the Euro Cup." Either way, the Germans are looking good so far in their first IC campaign.